Armenian Legal Center for Justice and Human Rights (ALC) Executive Director Kate Nahapetian emphasized the importance of property rights in the protection of religious freedom and genocide prevention during the State Department’s first-ever Ministerial to Advance Religious Freedom, which began in Washington, DC on July 24th. The Armenian Legal Center has been collecting information related to religious and personal properties stolen or confiscated during the Armenian Genocide as part of a process for their eventual return or compensation. It is the only community organization to do so, understanding the importance of consolidating this information in one place as a means towards redress and accountability for the genocide. 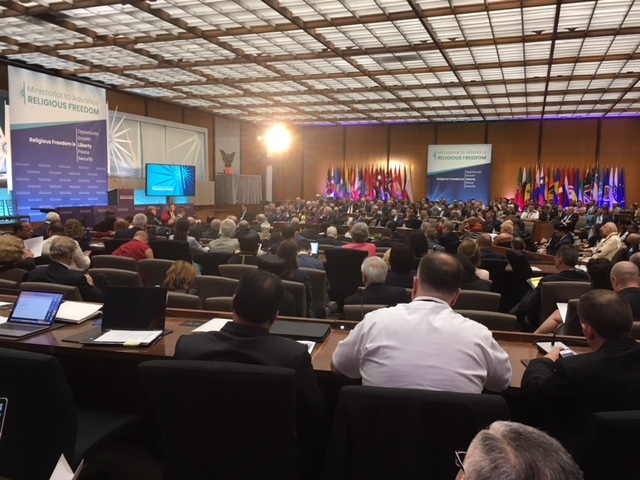 Over 300 religious freedom leaders from 80 countries around the world — including Armenia – gathered in Washington DC for the Ministerial. Individual testimonies from religious minorities across the globe punctuated the program. In his opening remarks, U.S. Ambassador-at-Large for International Religious Freedom Sam Brownback highlighted the case of imprisoned American Pastor Andrew Brunson, who has spent nearly two years in a Turkish jail on baseless charges. Following White House and State Department pressure, and a Senate threat to block international financial corporation assistance for Turkey, the Erdogan regime moved Brunson from jail to house arrest.